Have you ever been to a store where a product’s price tag didn’t match the price on the receipt? Or have you ever been over- or under-charged for time and materials? We expect revenue integrity in other industries, and with new value-based care models, increased patient payment responsibilities, and more intense government regulations, healthcare organizations are also turning to dedicated revenue integrity departments to safeguard their financial health. 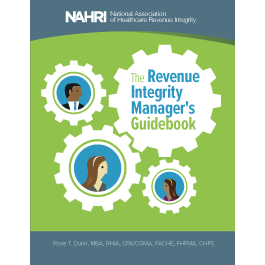 Whether you have an established revenue integrity department or are looking to form one, The Revenue Integrity Manager’s Guidebook is your all-encompassing reference guide to revenue integrity leadership. This book provides expert tips on developing and staffing a department as well as guidance on how to identify, monitor, and improve revenue accuracy. The Revenue Integrity Manager’s Guidebook provides a comprehensive view of the link between revenue integrity and the revenue cycle and explores how their components interact with each other. The book also highlights ways to improve the symbiotic relationship between the two departments. These revenue-saving secrets and strategies are invaluable for any healthcare organization. Her consulting firm, First Class Solutions, focuses on HIM-related services, including coding support, coding audits, and operations improvement. Dunn assists clients with their operational, revenue cycle, compliance, and strategic planning needs. She and her team have supported more than 50 hospitals and physician practices with ICD-10 preparation and education. Chapter 1: What Is Revenue Integrity?